exp. 11-30-17 means the coupon will expire on 11-30-17 and will no longer be useable. (SS 10/31/10) means a coupon came from the Smart Source insert in the Sunday paper on 10/31/16. 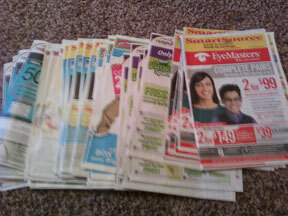 Inserts you get in the Sunday paper are: SS= Smart Source, RP= Red Plum, P&G= Proctor & Gamble (once per month). Insert coupons can be used at any store that accepts manufacturer’s coupons. Almost all grocery and drug stores do. Read more from my training guide. Now I post printable coupon deals, but since you can only print 2 per computer, and many hot coupons are only in Sunday coupon inserts, you will need to have a multiple newspaper subscriptions to become a cuckoo coupon shopper. Because if you use a $2.50 Tide Detergent coupon on a hot $4 Tide Detergent sale, in a few weeks you’ll run out of Tide. Since sale cycles are 6 weeks to 6 months, you’ll probably have to run out and pay full price before the sale happens again. Don’t waste your time running to the store to get a few items. You may as well stock up when prices are lowest and not have to buy again until the sell comes around. This saves you the most $$$. Get 1 Sunday paper for every family member. My family has 4 members, so I get 4 copies of the Sunday newspaper. When a sale is hot, I use up all my coupons and almost always have enough use product until the next sale and not too much that the product expires before I use it. It’s much cheaper to get a subscription than it is to buy the papers individually each week. My training videos here are free. You can always cancel if you decide you aren’t saving enough $$$ to cover the cost of the subscription. Find your local paper and sign up for up for discounted subscription rates & save 50% or more on local newspaper home delivery here. Order coupons at My Coupon Hunter; a coupon clipping service. She sends clipped coupons – you have to create an account FIRST to see the coupons available!